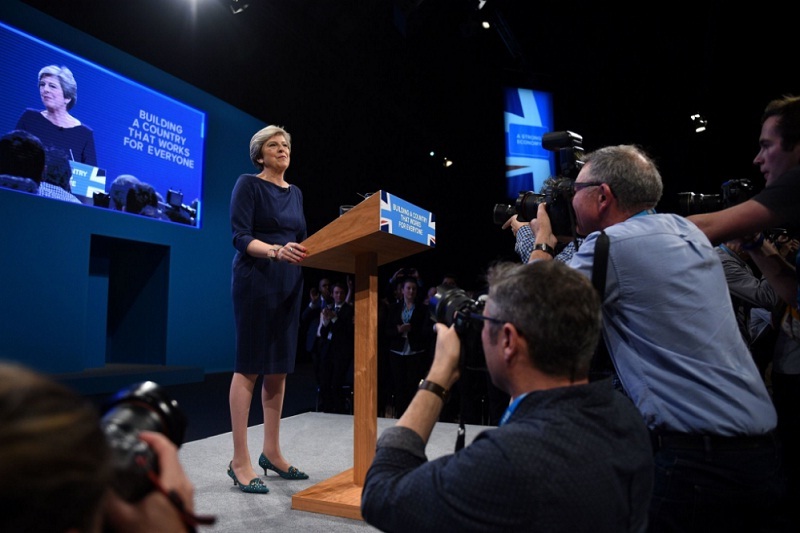 Prime Minister Theresa May delivering her speech at the Conservative Party’s annual conference, in Manchester, England, on Wednesday. The audience gave protracted applause to allow her time to rest her croaking voice. MANCHESTER, England — First there was the prankster, theatrically handing her a notice that she was being fired. Then her voice went, a persistent cough disrupting her delivery, making her speech often painful to the ear. Politics can be a cruel business, and just when Britain’s prime minister, Theresa May, needed a rousing, commanding speech to restore her authority over her warring Conservative Party, she had a nightmare. Ending a party conference dominated by speculation about her fragile leadership, Mrs. May struggled her way on Wednesday through her set-piece address, the audience periodically giving protracted applause to allow her time to rest her croaking voice. 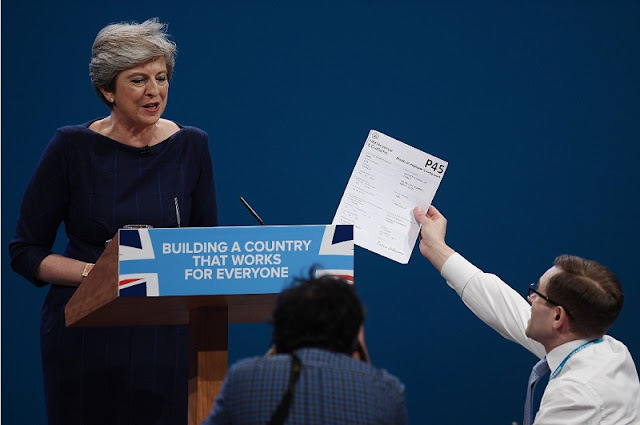 A prankster handing Mrs. May a job dismissal notice during her speech on Wednesday. She repeatedly drank from her glass of water, and at one point the chancellor of the Exchequer, Philip Hammond, handed her a cough lozenge. Sometimes she seemed almost to be reduced to a faltering whisper. Then, toward the end of the address, letters began to fall from the slogan behind her onstage. The speech highlighted the problems confronting Mrs. May — her battle to complete it seeming to some like a metaphor for her struggling premiership, the set of mishaps overshadowing the messages she hoped would dominate the news. The four-day conference in Manchester is the first since Mrs. May gambled by calling a general election in June, in which her Conservative Party lost its majority after an unexpectedly strong performance from the opposition Labour Party, destroying much of her authority in the process. Under the left-wing leadership of Jeremy Corbyn, Labour’s anti-austerity message struck a chord, particularly with younger voters, who turned out in greater numbers than usual, leaving many Conservative activists in Manchester wondering how to compete. As the debate about the Conservative Party’s future has unfolded at the conference center and beyond, Mrs. May’s potential successors have had a chance to grab the limelight, and none took that opportunity more ruthlessly than the foreign secretary, Boris Johnson, who has made two interventions undermining Mrs. May’s strategy for negotiating Britain’s withdrawal from the European Union, known as Brexit. On Wednesday, Mrs. May promised more homes would be built to tackle the country’s housing crisis, detailed a cap on energy prices and promised to forge a British version of the American dream. But, Mrs. May was soon interrupted by a prankster, who handed her a P45 — a form that is sent to Britons who lose their jobs — saying “Boris asked me to give you this,” before being ejected from the hall. First there was the prankster, theatrically handing her a notice that she was being fired. Then her voice went, a persistent cough disrupting her delivery, making her speech often painful to the ear.